Isn't that the cutest container! I found it at a garden center and with my husband's past having grown up on a diary farm I couldn't resist it. It's actually ceramic. They finished it so nicely you'd think it was metal! I chose petunias because I felt they have the right country casual look I wanted. In the center I put one of those new Supertunias. They look just like the New Guinea Impatiens except they can take full sun. See the white flowers in the center- and this one comes with variegated leaves. It should get taller and fuller and be a nice combo as the summer kicks in. The Lysimachia (Creeping Jenny or Moneywort) will drape along the sides and cozy it up! I'l be planting a few more things and trying to get more done outside this weekend. Hope yours is grand! This give-away has a retail value of $359! It's being offered by NOLA Couture through Ron's blog. 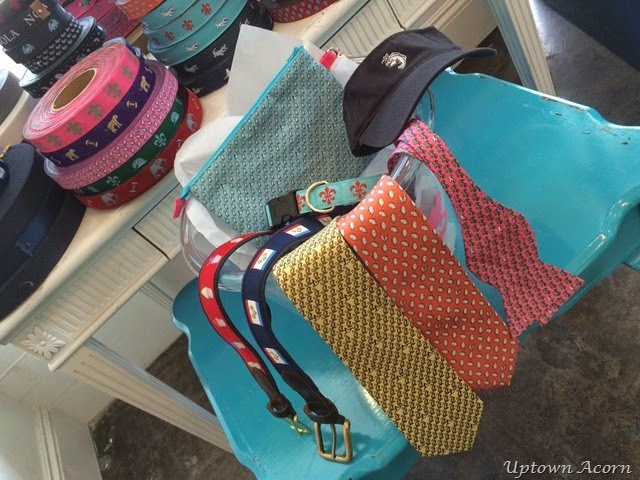 You get to select two ties, a bowtie, an adult and a child's size belt, a clutch w/wristlet, a cap/visor, and a dog collar all in your own choice of fabric. I'm not being compensated but I thought it was such a nice give-away I'd promote it! I'm entering too! There is an excellent "post" Ron did the day before that shows the interior of the store and the products they sell. I like the bowtie with the Ice Cream cones (my daughter's boyfriend loves wearing bowties)! If you can't use them all yourself they can be great gift items! As Ron would say- Cheers Ya'll ! I mentioned in my "post" about the living room that I went to a Pottery Barn outlet for the first time. In February I did a "post" and talked about a picture I liked with a white pitcher full of lemon branches. Well I walked into the PB outlet and there they were! Since I live in northern Michigan- there's no chance of growing my own lemon tree so the faux will have to do! The vase is also a PB score. Our daughter was visiting this weekend and noticed my window display and while we were out touring the countryside and wineries around here she spotted these little pigs and bought them for me. She liked their Tuscan coloring and knew they'd fit right in and she was right! A couple of weeks ago I ventured into an antique/re-sale shop and stumbled across this salt glazed crock/vase with Rochester Hills on it. That's the town I grew up in Michigan and I decided this was meant to be and for $7 I couldn't leave without it! I used to collect salt glazed pottery in the 90's and sold off a bit of it. I kept a few special pieces and now I have one more! I came across this jar I couldn't resist at a store while we were touring this weekend. I was in love with the thick embossed rooster on the front. I found a sales person (I suspect the owner) and asked her to show it to me (it was in an awkward spot and I wasn't comfortable getting it out) As she was handing it to me she says "I can make you a great deal on it" and she drops $20 right off of it- so it became mine! There were three of them and I suspect she'd had them for a while and wanted to move them. I haven't picked a spot for it but you know I'll get around to it! I have tulips blooming so I cut a random bunch and brought them in. They are pretty late this year. So there you have my Bits 'n Pieces! I've been working outside more than inside lately. I've been planting my annuals. If you have a moment click one more time "here" and visit me at my other blog. "Between Naps on the Porch for Metamorphosis Monday"
the energy lately to do everything I want. 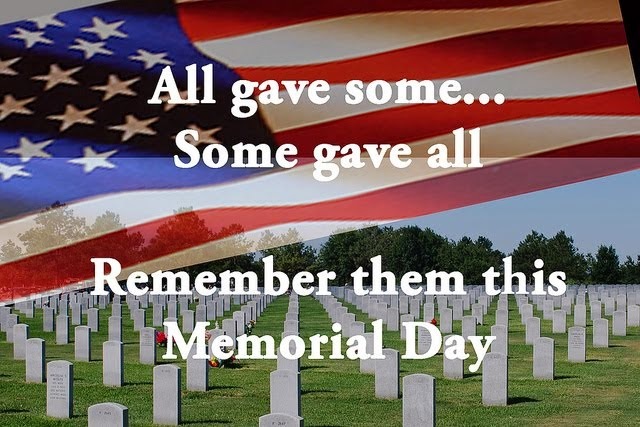 Wishing everyone a great Memorial Weekend! A simple patriotic table for two. I selected flowers and branches for filler from my yard and garden to create my centerpiece. The sun came out long enough for me to snap a few shots in between the rainy weather we're having right now. This tall handled pitcher is made of tin and decorated with berries. I wanted to suggest a picnic atmosphere with fruit and vegetables. I have two narrow glasses inside of the pitcher. One is upside down to support the 2nd one that is resting on it to hold the flowers. I didn't trust that the tin would hold the water and I needed to create a way to get the flowers up higher. These Homer Laughlin diner style plates added to the patriotic picnic feeling I wanted. The checkered design is repeated in the napkins and a tablecloth underneath. The corn on the cob dish added a splash of color and helps suggest a classic picnic food item! 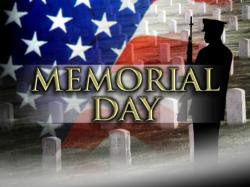 their lives for our country. tornado swept through their area.